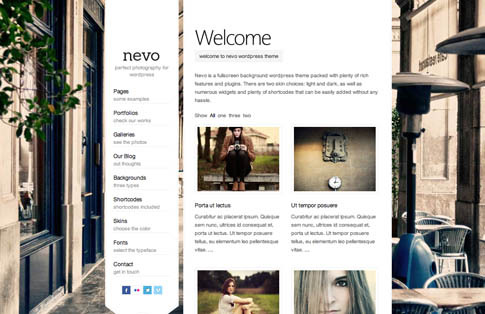 Nevo premium WordPress theme is a fullscreen background template packed with plenty of rich features and plugins. There are two skin choices — light and dark, as well as numerous widgets and plenty of shortcodes that can be easily added without any hassle. Make sure to spend a little time checking out the live demo at the end of the post. Enjoy! Come back and check out the showcase as we find more sites from around the web using Nevo.